Janome may not be as old as its rivals Singer and Brother, but it does have a track record of producing easy-to-use sewing and embroidery machines. That track record has made it one of the more reputable manufacturers of machines for sewing, embroidery, and serging. The company was established on October 16, 1921 as the Pine Sewing Machine. Fourteen years later, the Janome trademark was born. The company was renamed as Janome Sewing Machine Co. Ltd in 1954. In the 1960s, the company bought the New Home Sewing Machine Company which was founded in the 1860s. Janome has its share of coming up with innovations in sewing machine production. In 1964, it established a research lab in the Japanese capital of Tokyo. Seven years later, it released the first ever sewing machine that was both programmable and computerized. It was also the first firm to develop a computerized machine for domestic use, the first to have a professional style embroidery machine for home use, and the first to have a long-arm quilting machine for domestic use. Janome is also the company behind popular brands like Swiss Elna, Artistic Sewing Suite, and Kenmore for Sears. Janome produces machines for basic sewing, embroidery, and quilting. It also has specialty machines for serging. It has electronic and computerized machines that can be upgraded through software. Janome is known for its user-friendly products. Most of its models have computerized control screens for ease in use. A lot of Janome machines also have integrated memory, enabling users to save their stitches and patterns easily. There are also embroidery units with hoops and sergers that can get the job done quickly. 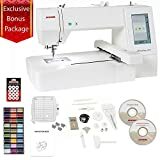 Janome machines usually have special features like stop/start/auto-lock button that eliminates the need to manually lock stitches in place, built-in thread cutter, automatic thread cutters, and bobbin winding thread cutters. Janome machines are extremely easy to use. Beginners as well as those who are out of practice will love the fact that they can use the machine after taking it out of the box and threading it. However, they may find the models with front-facing eye on the needle the easiest to thread. Another advantage of owning a Janome sewing machine is the affordable price. Most Janome machines are affordable compared to units from other brands, but the units still have the same features that one would covet from a modern sewing or embroidery machine. The Janome Memory Craft 350E is a classic, embroidery-only machine. From afar, it may look like your grandma’s old sewing machine. But move closer and you’ll realize it is a modern machine, with a grayscale backlit LCD screen and bright LED lights that you’d normally find in contemporary models. The 350E features 100 built-in embroidery designs, three fonts, two letter designs, and three embroidery frame designs. There are multiple ports for accommodating PC design card, USB, and ATA card. Its memory capacity can hold up to 100 designs. The Janome 350E is ideal for intermediate and expert-level hobbyists because of its advanced features. It’s also user friendly as winding the bobbin is simple enough even for beginners to accomplish with minimal guidance. Aside from the 100 onboard designs, users can download designs from the Internet and transfer it on the machine using ATA cards or USB memory stick. The slots for both are found on the right hand side of the machine. It comes with standard accessories such as two embroidery loops (large and standard), four bobbins, two spool holders, and spool felt. Extra spoon pin and needles are also included as well as instructional DVD. While the price tag may shock some, bear in mind that this is a machine that is suited for professionals so the price is certainly justifiable considering how many projects a user can potentially finish in such a short time using the 350E. The Janome Memory Craft 200E and Janome 9500 are other good alternatives to the 350E. Unlike the 350E, the 200E is a budget-friendly unit with a price an affordable tag. Like the 350E, the 200E is an embroidery-only machine that is user-friendly and packed with features that make threading fun and easy. It has 73 built-in embroidery designs and three monogramming fonts. There’s an integrated editing function that can be access on the screen. Users can make embroidery up to 5 inches by 5 inches in size, which is just the right size for home decors and garments. Hoop size is 5 inches by 5 inches, although there is an optional hoop size of 2 inches by 2 inches. Also included in the product package is a 12-pack, pre-wound plastic bobbins from Janome. The machine has an embroidery speed of up to 650 stitches per minute so you can finish a good project in less time. You can save up to 100 different designs on its built-in memory. The 9500, meanwhile, is almost of the same price as the 350E. It has numerous custom embroidery features that can make digitizing embroidery quick and hassle-free. Like the 200E, it has standard and large embroidery hoops to accommodate embellishment designs. It has 90 built-in designs and 98 sewing stitches, three built-in embroidery fonts and 2 and 3 letter monograms. If those designs aren’t enough, you can download from the Internet and transfer them to the machines using an ATA card reader and adapter. It is easy to operate thanks to its 4.7 inch backlit LCD touchscreen. The 9500 has an embroidery area of 5.5 inches by 7.9 inches. You can sew multiple layers of heavy fabrics on this machine with relative ease. As you may have observed from the features of the aforementioned Janome models, the company has certainly continued its tradition of producing quality embroidery machines. Janome embroidery machines are easy to use, modern, and relatively affordable. It is unlikely you will regret buying a Janome embroidery machine given its superior qualities.